Please note that all guest rooms at our two-story hotel open to an exterior walkway. Guests access the second floor by stairs. If mobility impaired- please request a first floor room. The Hampton Inn Houston - The Woodlands hotel is located 30 miles north of downtown Houston Texas and just 5 miles south of Conroe Texas. This Houston Texas are Hampton Inn hotel is located off the Interstate at Exit 79 and is convenient to the Research Forest Companies many shopping venues and the Cynthia Woods Mitchell Pavilion that provides popular entertainment from April to October. 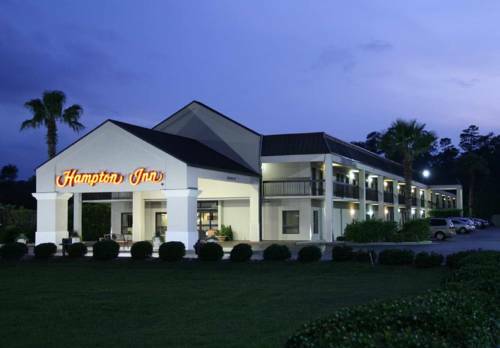 Guests of this Hampton Inn Hotel in The Woodlands Texas can enjoy golfing boating/water activities on Lake Conroe shopping and fine dining when visiting our hotel. The Hampton Inn Houston - The Woodlands hotel features 78 rooms on 2 floors with exterior entrances and provides rooms with 1 king 1 queen or 2 extra long double beds. All King and Double rooms at this Woodlands Texas hotel are equipped with microfridges. Other amenities of the Hampton Inn Houston - The Woodlands hotel include an on-site exercise room an outdoor heated swimming pool/whirlpool and a business center with a meeting room for up to 30 people. Guests of The Woodlands Texas Hampton Inn hotel will also enjoy the complimentary On the House hot breakfast and the On the Run breakfast bags /available Monday - Friday/. There are also many fine restaurants within one mile of the hotel. We love having you here at the Hampton Inn Houston - The Woodlands hotel in The Woodlands Texas. All reservations must be guaranteed with a major credit card or advance cash deposit to hotel regardless of time of arrival. All reservations must be cancelled by 4pm host time unless deposit is required. Policy subject to change. all reservations must be cancelled 24 hours prior to arrival host time unless deposit required. if this reservation has been made electronically please cancel it electronically to avoid confusion and a no show bill. Policy subject to change. - NASA - Houston Space Ctr. - The Woodlands Executive Ctr. - Belz Process Chemicals Inc.
- Eckards Drug Dist. Ctr. - M.D. Anderson Cancer Rese. - Mitchell Energy - Devp. - The Woodlands Exe Ctr. ~29 miles from The Woodlands. ~45 miles from The Woodlands. ~61 miles from The Woodlands. ~69 miles from The Woodlands.